Did I tell you I found Biscoff (finally!) at a local grocery store? Did I tell you I gave up candy for Lent (again)? Today is Valentine's Day and I gave up candy for Lent, which (most conveniently) began yesterday. No, I'm not Catholic, but I don't see anything wrong with giving something up that I consider a major vice. Same goes with candy. It's SO easy to eat candy whenever, wherever. And *most* of us do. By saying, "NO CANDY, KRISTIN! ", I'm making the choice to become cognizant* and aware of my mindless, all-day-long sugar consumption. So, really now, it's a very analytical* decision. In a microwaveable bowl, melt the sweetened condensed milk, chocolate chips, and Biscoff together at 45 second intervals, stirring in between, until smooth. Stir in the vanilla. Fold in the cookie chunks. Spread into a foil lined 8x8 pan (or, I used a pie pan). Stick it in the freezer until hardened (about an hour). Let it soften a little before cutting. We are giving up red meat for lent. I tend to eat lots of it just because it's easy and it goes in a lot of the kid friendly food I make for our family! I'll start substituting ground turkey and ground chicken in some dishes. I wish I was a sweets person. I was a baker for a year too...I do crave chocolate a lot and I would rather have candy than anything! No freakin' way. That fudge looks so beautiful (I can use that word for food, right??)!! And good luck with the candy. I'm not giving up anything for Lent - I am the definition of a binge-eater, so I never last the 40 days and feel bad about myself if I go nuts one day. Instead, I am eating in moderation, 1 dessert a day, and exercising (in some way) every single day. Yep, I'm going to need to make fudge sometime soon. I didn't grow up participating in Lent, but the idea of giving something up to focus on other things is a great idea. that looks SOOO good! way better than the valentines day fudge I made! I'm not Catholic, but I think giving up something for Lent is regardless is a really cool idea! It's a testament to your willpower, I guess. It's my parents' anniversary and my guidance counselor at school's birthday next week and I'm making them your sugar cookie fudge! 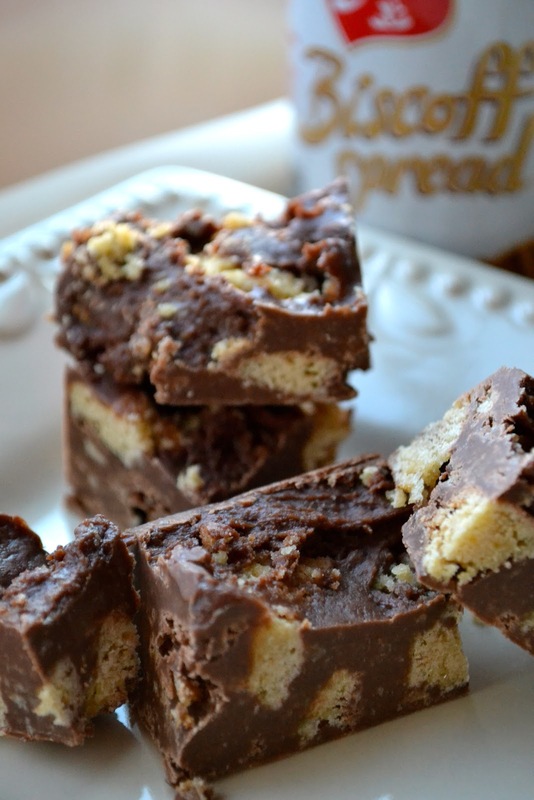 This fudge looks so good!! We tried the crunchy Biscoff a while ago, fell in love, and have never been able to find it again, sadly. I gave up sweets for Lent too, and I'm already craving them. Do you do the cheat on Sundays?